If my mother is reading this, she should stop right now. Especially if she doesn’t want to know what she’ll be getting for her birthday. 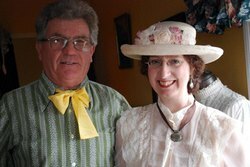 Kimberly and her farmer husband Ivan Allin, both in Victorian costume, both welcomed me to the tearoom situated in their farm home where photos of Ivan’s Victorian ancestors hang on the wall. 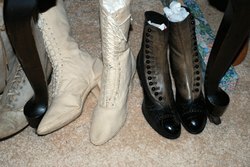 History buffs like could spend hours poring over Kimberly’s fascinating collection of Victoria artifacts, including these white canvas bathing boots designed to cover ladies ankles and protect their modesty. 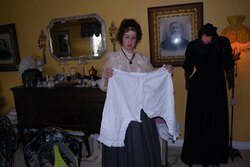 Protecting modesty seems to have been somewhat of an obsession as Kimberly explained, “a lady never wore fewer than seven layers of clothes.” One layer would be these crotchless bloomers. 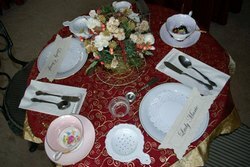 The skirts of Kimberly’s reproduction costume rustled pleasantly as she bustled between tables explaining the place setting which includes a porcelain tea strainer to catch the loose leaves and a tea timer for a perfectly steeped cuppa. Even the paper napkins were embossed the Tea Granny’s logo, as though they were monogrammed linens. With a selection of more than 40 teas, making a choice wasn’t easy, but I finally settled on a tasty single estate Mim Darjeeling. Then came the next serious decision: a choice of teapot. After clearing out palates with delicious berry compote, the tea and an assortment of crustless sandwiches were served. Using vintage cookbooks for inspiration, Kimberly produces some tasty and unusual fillings, including a wonderful sockeye salmon with red pepper jelly and three-year-old cheddar with ginger chutney. A colourful three-tiered stand followed, laden with rose petal scones, strawberry jam, fresh fruit and an assortment of pastries baked fresh by Kimberly earlier in the day. Luckily “Lady Kimberly” happily supplies boxes so we could take home all the little treasures we were too full to finish off, like the tasty mini tartlets filled with lavender-scented peach jam. 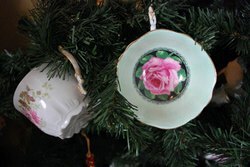 Christmas teas are very popular and feature seasonal treats. Advance booking is required. Afternoon tea with Kimberly Chant-Allin, or “Lady Kimberly” is so engaging that it will be remembered long after the last Balmoral shortbread has been nibbled, making it a perfect gift for hard-to-buy-for mothers, sisters, wives and friends. While you don’t have to be female to enjoy it, afternoon tea certainly is rooted in feminine tradition, according to Tea Grannys proprietor Kimberly Chant-Allin. 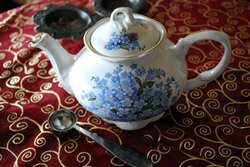 “In the parlour, ladies could gather and talk over tea…prior to the telephone, it was an important source of information. Forget the socks and chocolates. This Christmas, create some lasting memories by giving some of Durham Region's best experiences. 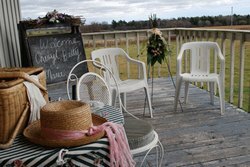 Nature lovers, snow bunnies, history buffs and style mavens will all find the perfect outing close at hand. 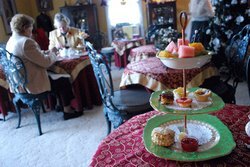 Afternoon tea ($15.95) at Tea Grannys in Clarington is not just an amazing spread of tasty sandwiches, freshly baked scones and sweets. 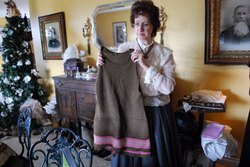 It's an afternoon of Victorian social history as Kimberly Chant-Allin, aka Lady Kimberly, demonstrates the customs and costumes that were popular a century ago. Long after the last Balmoral shortbread and rose petal scone have been eaten, friends will remember the crotchless Victorian bloomers and woollen bathing suits complete with ankle-covering canvas boots. Reservations required. Betty Zyvatkauskas is a Durham Tourism writer. Look for her columns each month in This Week and her blog at www.newsdurhamregion.com.